THE GREEDY old man, Bob Arum, is blabbing once again. Nothing really satisfies his greed. Arum has started ranting like a mad man upon learning he has no iota of involvement in the June 24 Pacquiao-Matthysse duel in Kuala Lumpur. Arum has apparently metamorphosed from being a promoter to a fight saboteur. Oh, really? Arum’s statement clearly depicted how voracious he is when it comes to money. Arum is not privy to the transaction so it’s better for him to keep his mouth shut. Why begrudge Senator Manny Pacquiao for not involving Top Rank in the fight? As far as Team Pacquiao is concerned, Arum has no more say in the Pacquiao-Matthysse fight. “I reviewed the contract and I found out that Bob Arum has no more say even in the rematch, should there be any, between Manny Pacquiao and Australian boxer Jeff Horn,” Viernesto said. And so, just let Arum rant to his heart’s content. You know, Arum had sabotaged two previous negotiations for the holding of Pacquiao fight outside the United States. The first one was the planned Pacquiao Dubai fight then the other was the fight supposed to be staged either in Macau or Hongkong. In two separate occasions, Arum called up Pacquiao’s financiers threatening to file a lawsuit if Top Rank is not included in the promotion. They cowed in fear resulting to the scrapping of the fight. This time, Arum, for the third time, tried to sabotage the fight by calling up Pacquiao’s Malaysian financial backers. No dice, old man. He was ignored. Pacquiao’s MP Promotions is staging the Pacquiao-Matthysse fight in Malaysia. Golden Boy Promotions top honcho, Oscar Dela Hoya, together with the Matthysse camp will arrive in Manila on April 4 to formally announce the fight. It was originally scheduled on March 22 but Dela Hoya called up Pacquiao asking for a later date in observance of the Holy Week. “Dela Hoya called up asking me if we could reset the Manila launching after the Holy Week. That’s why it was moved to April 4,” Pacquiao bared. Both camps will fly out to Malaysia in the evening of April 5 for the formal launching the following day of the Pacquiao-Matthysse bout. Meanwhile, let’s never mind the skeptics and modern-day doubting Thomases. They will eat their words come June 24. 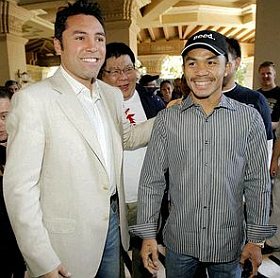 Photo: Oscar de la Hoya (L) and Manny Pacquiao (R) met at the MGM Grand Hotel in Las Vegas before their fight on Dec. 6, 2008.